There was a typhoon on our scheduled trip to the shores of Puerto Galera October of last year. In fact, I almost called on all the saints I know during our ferry ride to the island. 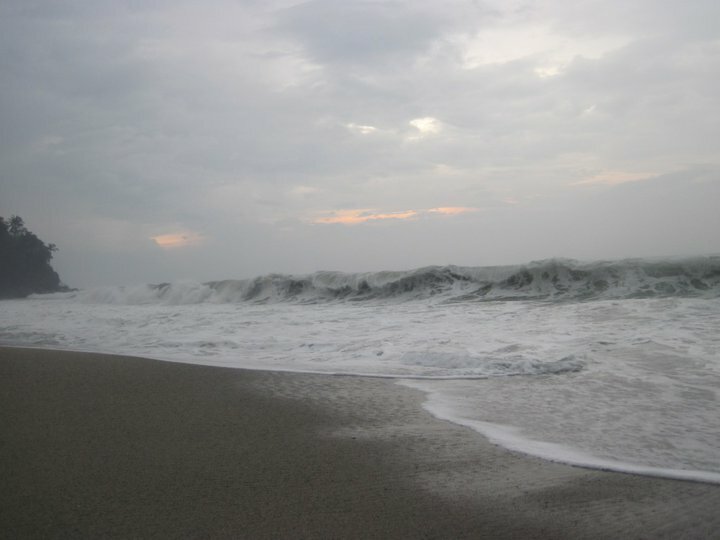 When we got there, the weather is still gloomy and in effect, the waves were extraordinarily strong. But what the heck, I and my college friends are definitely not passing on the chance to beach bum and enjoy the mini-reunion. So despite the rain and the strong current, we played in the sand and walked a few steps into the water. We were taking pictures endlessly so we're facing the shore and in the middle of waddling and jumping and giggling with my maharot friends, a couple of huge waves ate me entirely! For a moment there I thought I was gonna die! I was panicking and struggling to stick my head out to the surface. I am certain that the water is just about waist-deep because I'm on bent knees and could feel the sand but the current kept pulling me down.